Whitley, UK, 22 November 2018 – The original luxury compact SUV has got even better. At home both in the city and the mountains, the new Evoque joins the Range Rover family with a choice of hybrid-electric engines. Having pioneered the luxury compact SUV market, with global sales of over 775,000 and more than 225 international awards, the new Range Rover Evoque is a sophisticated evolution of the original. Combining unrivalled Range Rover heritage with cutting-edge technology – designed, engineered and manufactured in Britain – it meets the needs of today's customers. Finbar McFall, Global Marketing Director, Jaguar Land Rover, said: "Eight years ago we created a new segment and the world followed. Now we have redefined what it means to be a luxury compact SUV. With design and capability at its heart and the latest technology to hand, the new Evoque meets your needs like never before and ensures you reach your destination, no matter the conditions." Building on the original's instantly-recognisable design, the new Evoque is a sophisticated evolution of the distinctive coupé-like silhouette, typified by its distinctive fast roofline and rising waist that identify the Range Rover family. The introduction of jewel-like elements such as super-slim Matrix LED headlamps provide a more sophisticated front and rear lamp graphic. Flush door handles add to the smooth, sculpted aesthetic, while sweeping directional indicators create a purposeful signature. Optional R-Dynamic details and copper accents add to the unique appeal. Inside, the finely crafted design integrates uncluttered surfaces and simple lines with carefully curated premium materials to create a luxurious, minimalist, digital cabin. Technical textiles that use recycled plastics are offered as premium alternatives to leather, such as a Kvadrat wool blend and Miko suedecloth, as well as Eucalyptus and Ultrafabrics options. The cabin is designed to be a calm and serene space, ensuring comfortable, healthy and happy occupants, with technologies such as the twin touchscreen Touch Pro Duo system, featuring new, faster software, 20-way seat controls and cabin air ionisation that complement the increased interior space. The footprint is almost identical, yet built on Land Rover's new mixed-material Premium Transverse Architecture, there is more interior space than before. A longer wheelbase yields 20mm extra rear kneeroom and an increase in small item stowage – the larger glove box and centre cubby can now fit tablets, handbags and bottles with ease. The luggage space is 10 per cent larger (591 litres) as well as much wider and easily fits a folded pram or set of golf clubs, with space increasing to 1,383 litres when the flexible 40:20:40 second-row seats are folded. The new architecture has been developed for electrification, with a 48-volt mild-hybrid available at launch and a plug-in hybrid model offered around 12 months afterwards. The mild hybrid powertrain is a first for Land Rover and works by harvesting energy normally lost during deceleration thanks to the engine-mounted belt-integrated starter generator, storing it in the under-floor battery. At speeds below 17km/h, the engine will shut off while the driver applies the brakes. When pulling away, the stored energy is redeployed to assist the engine under acceleration and reduce fuel consumption. The result is a refined, quiet and efficient drive in built-up traffic heavy areas, in addition to efficiency savings. The mild hybrid powertrain will be available on the range of four-cylinder Ingenium diesel engines as well as the 221kW/400Nm petrol engine. An even more efficient plug-in hybrid electric vehicle (PHEV) model will also join the range next year. The famed Range Rover command driving position has jumped into the digital age, with a segment-first 'smart rear-view mirror' that transforms into an HD video screen. If rear visibility is compromised by passengers or bulky items, the driver simply flicks a switch on the underside of the mirror and a camera feed from the top of the car displays what is behind the vehicle in crisp high definition. The screen provides a wider (50-degree) field of vision and superior visibility in low light. The new Evoque is also the first in the world to feature Ground View technology, which effectively makes the bonnet invisible by projecting camera imagery onto the upper touchscreen to show the driver a 180-degree view under the front of the vehicle. This is useful when negotiating difficult parking spaces, navigating high city centre kerbs or tackling rough terrain and is the realisation of the Transparent Bonnet technology previewed by Land Rover in 2014. Nick Rogers, Executive Director, Product Engineering, Jaguar Land Rover, said: "Underneath the skin is an engineering and technical revolution. The architecture is all-new to enable electrification, with only the door hinges remaining unchanged. The new underpinnings also ensure renowned Range Rover refinement and capability. 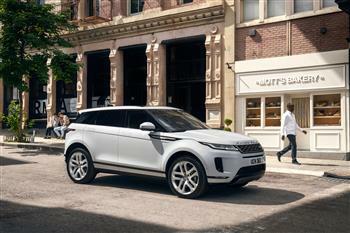 "Evoque is now more digital than ever. The software that sits behind the infotainment system has been advanced to make it sharp, smooth and intuitive. On top of that, we've added Apple CarPlay and Android Auto enabling seamless smartphone integration." Evoque is the first Land Rover with Smart Settings, which uses artificial intelligence algorithms to learn the driver's preference and acts as an onboard butler. In addition to seat position, music and climate settings, Evoque can control massage and steering column preferences to maximise comfort. Jaguar Land Rover's commitment to the UK car industry continues following a £1 billion investment to support its creation and delivery. This includes £110 million into the company's UK manufacturing plant in Halewood, Merseyside, to develop the state-of-the-art flexible manufacturing facility. 20MY Range Rover Evoque, world premiere. 20MY Range Rover Evoque VNR Short Edit.